Produced by the US Mint since 2000, the 2009 Native American $1 Coin has received a bit of a facelift over its predecessors. 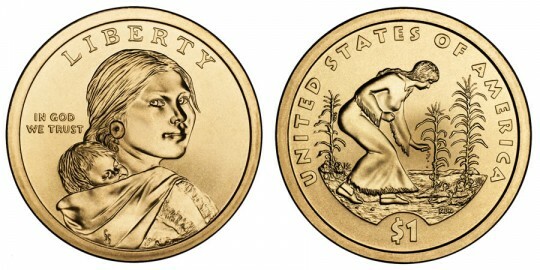 The Native American $1 Coin Act dictates that the reverse of the coins should display images portraying the important contributions Native Americans have made to the history and development of the United States. "Agriculture" was chosen as the theme for 2009 and so, appropriately, the reverse of this coin showcases a Native American woman planting seeds of corn, beans and squash. It has long been acknowledged that the first settlers from Europe probably would not have survived if it was not for the insight into their techniques and plants that the Native American's gave them. Seeds of corn, beans and squash are significant as they are known as the "Three Sisters Agriculture". Somewhere around 1000 A.D., probably in central Mexico, the Native Americans discovered that the three plants, when planted together, actually improved the yield of each of them. This symbiotic relationship is attributed to the fact that the squash provides ground cover, discouraging weeds. The corn stalks, for their part, provide a place to climb for the bean vines, which in turn adds nitrogen to the soil. Update: This coin was followed the next year by the 2010 Native American $1 Coin. As it has since the year 2000, a portrait of the famous Native American Sacagawea designed by Glenna Goodacre is displayed on the obverse of the Native American $1 coin. Sacagawea accompanied Meriwether Lewis and William Clark on their expedition from the east coast through the unexplored wilderness of the United States to the Pacific northwest. On Sacagawea's back is Jean Baptiste Charbonneau, her infant son who was also along on the expedition. "LIBERTY" and "IN GOD WE TRUST" are shown as well. The inscriptions "$1" and "UNITED STATES OF AMERICA" surround an image of a Native American woman planting seeds of corn, beans and squash. It was designed by Norman E. Nemeth.